THE SKINNY: Exfoliation is good for skin; you can't really argue that fact. 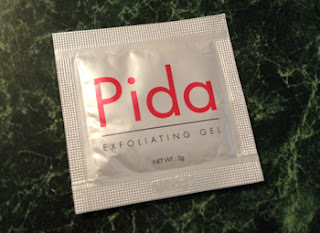 Pida Exfoliating Gel makes it a little easier to exfoliate with a product that is simple to use and is not rough or smell harsh (issues that sometimes arise with exfoliators). I used the sample on my face and it felt fantastically smooth. And because of the texture of the gel, my face was not red or irritated after use. (A problem I can often have with harsher exfoliators because of my somewhat sensitive skin.) The formula contains aloe vera, antioxidants and Vitamin C, which are all great for skin. Pida is advertised to help with rough patches, acne and dull skin. The only thing that really scares me about this product is the price tag. If it were a little less pricey, I would seriously consider adding it to my skin care routine. KEEP OR TOSS: Keep. It really does brighten skin. CHECK IT OUT: Learn more about Pida online and buy from Beauty Army or Urban Outfitters. Want to try Pida for yourself? We are giving one Beauty Test Dummies reader a full-size bottle ($54 value)! Just enter using the Rafflecopter below. Tweet daily plus "LIKE" this post on Facebook for extra entries. Good luck! We'll pick a winner on Sept. 30. DISCLOSURE: Pida provided a sample for review and the full size item for this giveaway. The opinions stated are those of Beauty Test Dummies alone.